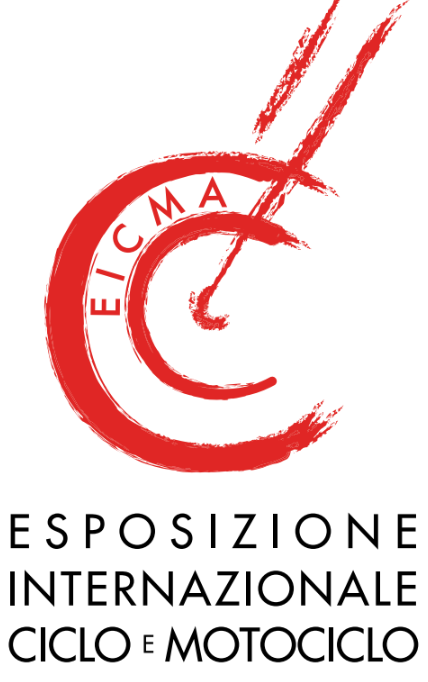 EICMA is one of the mail sponsor of NIAF this year. It is an acronym for Esposizione internazionale del ciclo, motociclo, accessori, the most important trade fair event for the entire 2-wheel sector comprising motorcycles and bicycles. At first entry, the large hotel is unassuming. The grand lobby, at once welcoming and stately, gave no indication that a vibrant culture’s excellence was on display a floor below at the Expo Italiana, with live music, film screenings, wine and olive oil samples, and a gelato-making demonstration. More than 60 exhibitors, including Alitalia flights, Ferrero’s Nutella hazelnut spread, and Italian American painters displayed their products and craft in a crowded exhibit hall open to the public. Intimate, black tables with navy blue umbrellas formed a café and transformed the hotel exhibit hall into an Italian piazza. Parents and grandparents sat around steaming cups of illy coffee while children danced around the tables and small stage featuring live traditional Italian music. It is impossible, even outdoors, to recreate the warmth of the Italian sun or the echo of voices speaking in dialect on ancient walls, especially on a crisp fall day in Washington, DC. But the devotion to quality food, admiration of sublime Italian art, and love of family were all present this past Saturday. Late in the afternoon, visitors began to dissipate from the exhibit hall to prepare for the main event, the famous evening gala, a black-tie event of more than 2,000 attendees. Italian style and pride were on display as groups of women in elegant and dazzling dresses whirled through the mezzanine and descended the staircase to the ballroom, where the lights in the magnificent space glowed warmly. Even those who are not Italian were Italian that night, as being Italian is more than just an ethnicity or a culture, it is also a feeling. 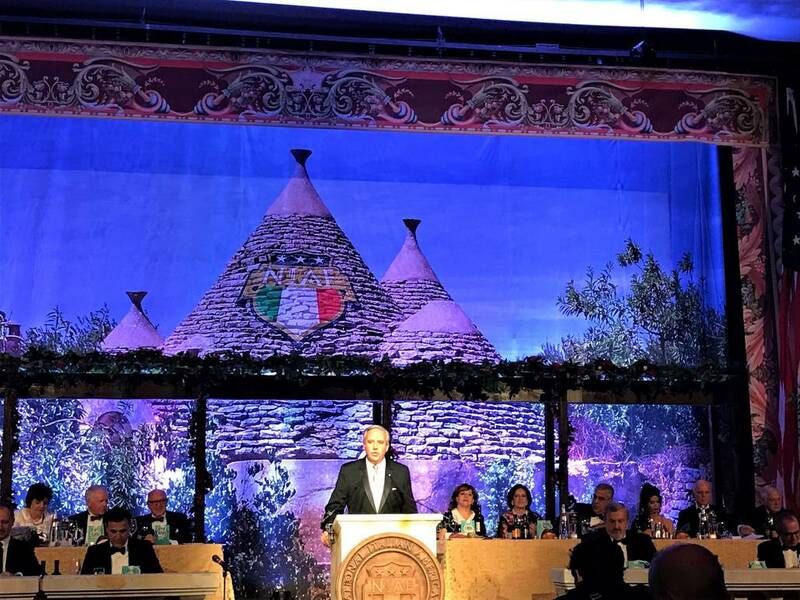 Puglia was the most eye-catching attendee, and center stage of the gala as the 2018 Region of Honor. Behind the honorees was a backdrop image of delightfully rounded, dry stone huts, or trulli, with conical roofs. The trulli are traditional to the Apulian region of Italy and served as temporary field shelters and storehouses, mostly in the nineteenth century. The edges of the image were adorned with brightly colored flowers of pink, orange, and yellow. 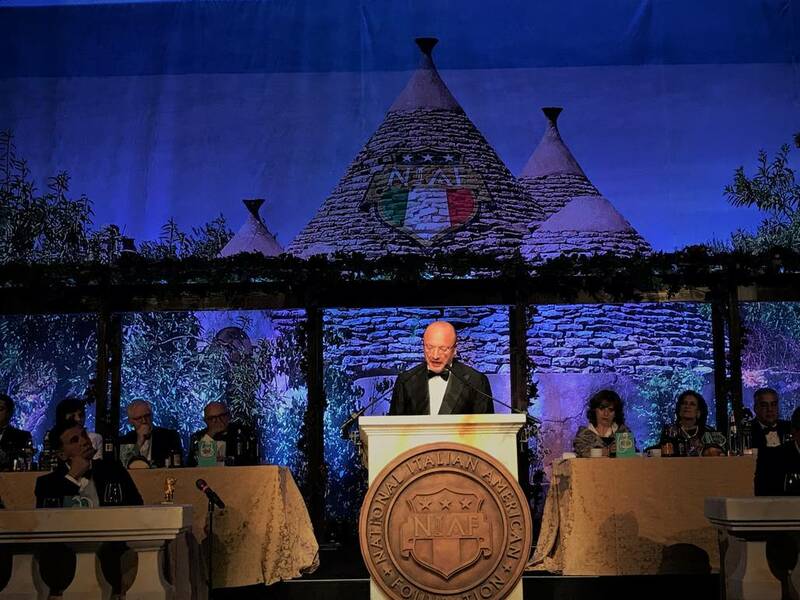 In this Italian paradise setting, guests greeted friends around tables with wine and antipasti while NIAF Chairs Patricia de Stacy Harrison and Gabriel A. Battista, members of the Government of Italy, and the honorees took to the stage. 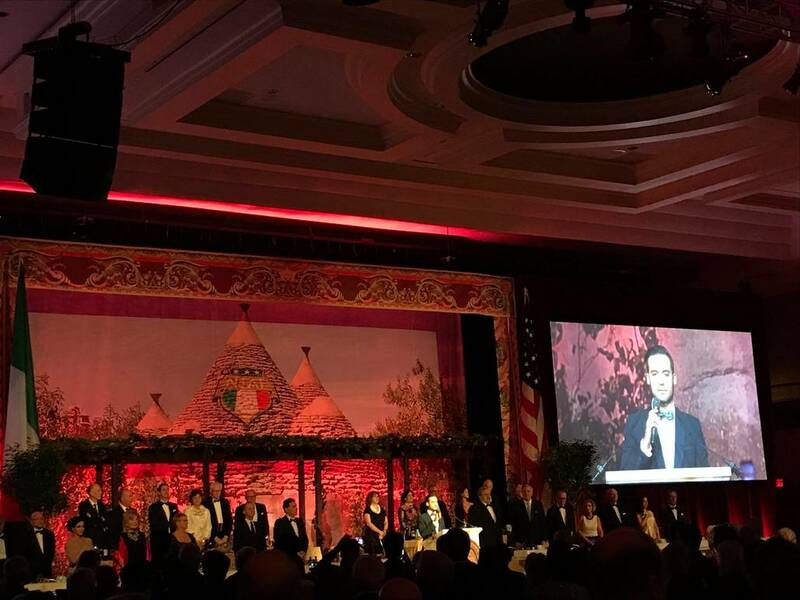 This year, the six honorees included Chef Lidia Bastianich; President of Confindustria, Vincenzo Boccia; Chairman and CEO of Bristol-Meyers Squibb, Giovanni Caforio; CEO of Kiton, Antonio De Matteis; Founder of the Angel Group, Cav. Lav. Vito Pertosa; and economist and entrepreneur Carl Schramm. The Master of Ceremonies was Mark DeCarlo, three-time Emmy Award winner, comedian, and travel expert. 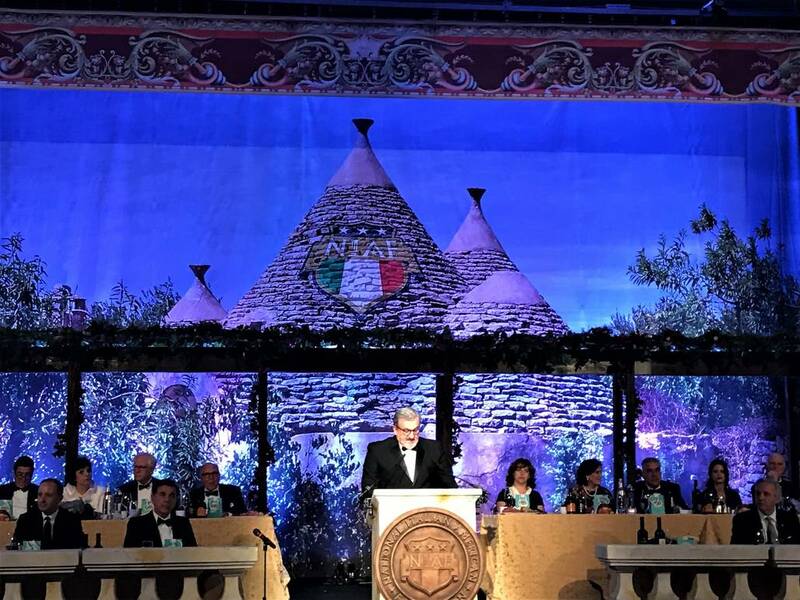 Vincent Boccia, CEO of Arti Grafiche Boccia and President of Confindustria, was awarded the NIAF Leonardo da Vinci Award in International Business. “When beauty… and technology come into play, Italia is foremost,” he said. As CEO of the luxury clothing company called Kiton, headquartered in Naples, Italy, Antonio De Matteis attributed the brand’s success to the “importance of family and obsession for quality.” He was honored with the NIAF Leonardo da Vinci Award in Business. Next, Honoree Vito Pertosa, a native Pugliese born in Monopoli and founder of Angel, an industrial and high technology holding company, received the NIAF Leonardo da Vinci Award in Technology. He thanked his colleagues and family for his remarkable success in a brief but touching speech. Bastianich grew up behind the Iron Curtain in Pola, a small city on the southern tip of the Istrian Peninsula. Eventually, communists changed their last name, took their religion, and forced them out of speaking their Italian language, “so we were forced to flee,” Bastianich explained. The family escaped across the border to Trieste, Italy, where they spent two years in a refugee camp. Bastianich helped the nuns of the school she attended by cooking in the kitchen. Finally, in 1958, sponsored by Catholic Charities, the family boarded a plane to New York. “It is impossible to talk about Italian Americans without talking about immigration,” Bastianich stated. The centerpiece of NIAF’s celebration is the ability and the freedom to immigrate to America, to nurture a better life. “In this world today, more than ever, sitting together to connect with family and friends is so important,” she adds. “We may have hundreds of friends on social media, but our real friends are the ones we share meals with. 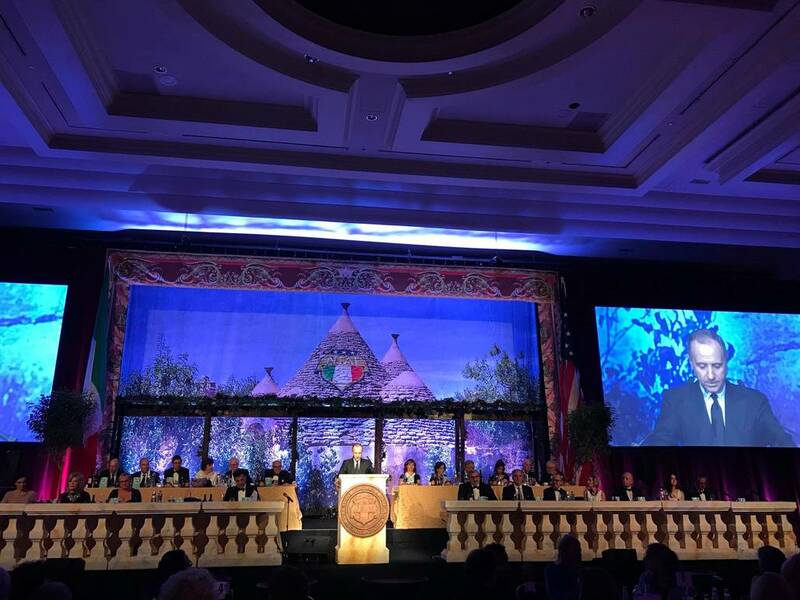 Sharing food is a way to connect and nurture others with something you made.” The NIAF Gala brought together Italian Americans from all over the country to do just that. 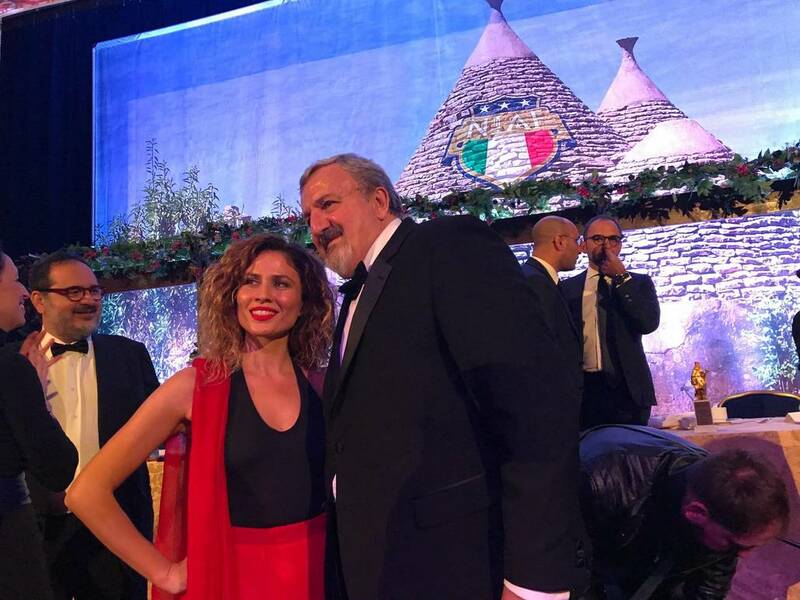 An Italian-themed auction after the speeches featured a large selection of high-end offerings, including a signed Inter Milan jersey, a trip to Sorrento, and an Italian-made purse signed by none other than Andrea Bocelli. The formal ceremony concluded with traditional Pugliese music and dancing. Guests abandoned their tables to crowd around the stage up front as women beat tambourines and a band played the violins and the drums. 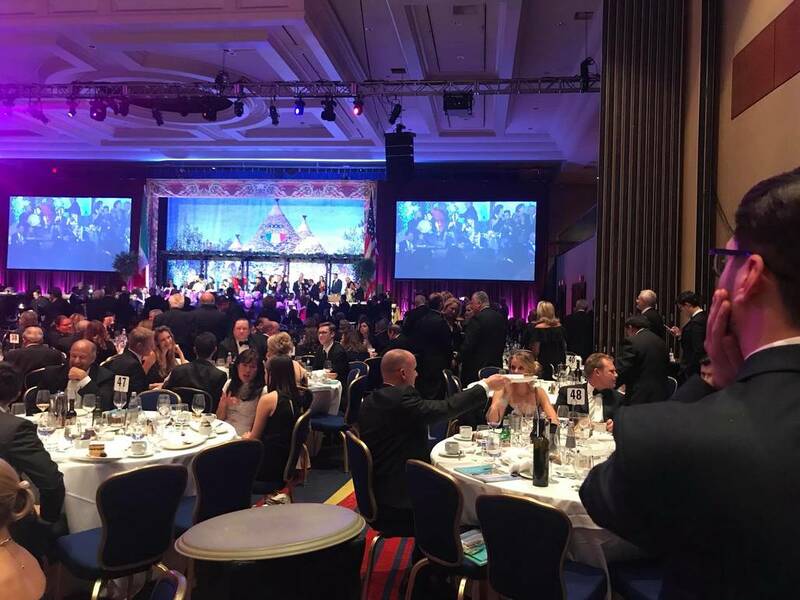 The annual after-party continued to shake the mezzanine of the hotel, as some 2,000 Italian Americans fueled by a sense of pride and deep red wine danced the night away to karaoke with both American and Italian songs. The repertoire of the crowd ranged from “I Will Survive” by Gloria Gaynor to “Fly Me to the Moon” by Frank Sinatra. A rainbow of neon lights sparkled over the dance floor, illuminating the multitude of people who owed this night and their life in America to brave ancestors who crossed an unforgiving sea and arrived at Ellis Island decades ago. The following Sunday morning, those who could muster it trickled into the Holy Rosary Church, the Italian National Parish of Washington, at 10:30 am for a mass in Italian. The Holy Rosary Church was established in 1913 to serve the Italian immigrants who first lived in its immediate neighborhood. 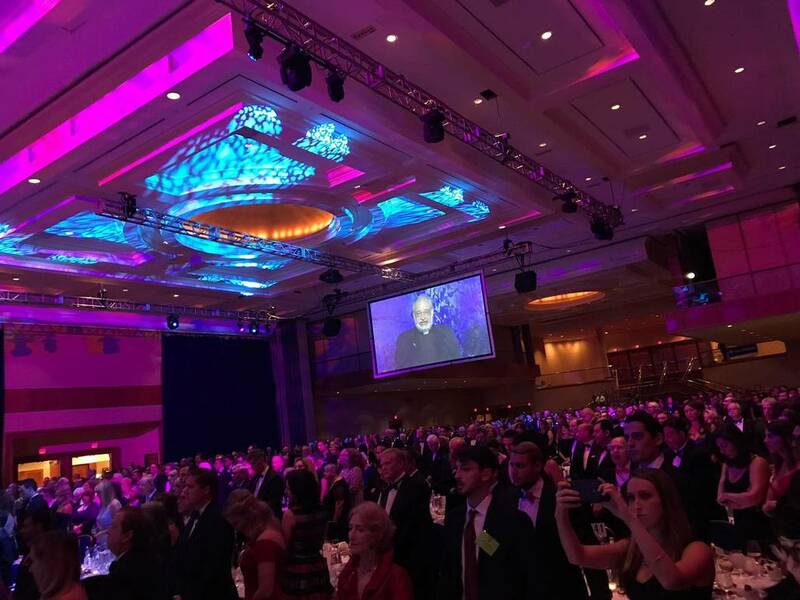 It is truly fitting that the NIAF Anniversary Gala weekend ended there, in a space of remembrance and gratitude for those who came before us. 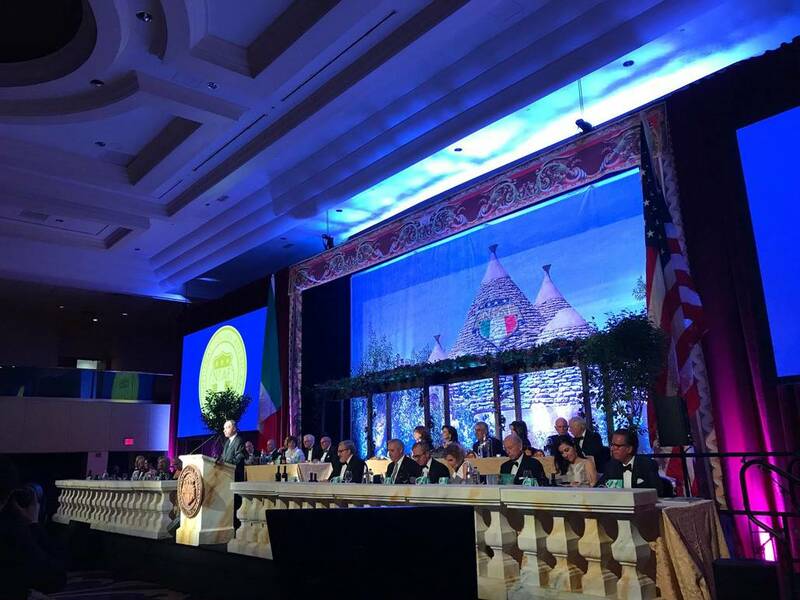 The National Italian American Foundation (NIAF) is a non-profit, non-partisan organization dedicated to preserving, promoting, and protecting the Italian American heritage and culture. To learn more about NIAF and become a member, please visit www.niaf.org.